Yesterday afternoon, I was sitting at my computer, working on something nerdy and uninteresting to most of you, when Amber comes toddling into the room with a big smile on her face. She was carrying a pair of her shoes, one in each hand. She held them up to me and eagerly handed them over. I asked her if she wanted to put the shoes on and she looked down at her feet. 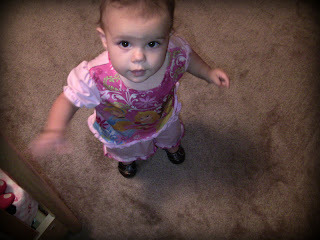 So, I told her to sit down and she sat motionless, watching while I put the shoes on. I told her to go show the shoes to mommy and she immediately turned and marched out of the room, staring down at her feet the whole time. It was adorable. 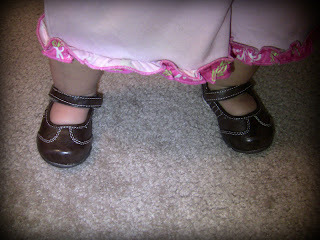 She's worn shoes before, of course, but she's never asked to wear them and gotten excited about it.